Did you know that you can freeze bananas? I buy bananas every few days, and it never fails that one or two of them ripen too quickly. Once that happens I just toss them in the freezer. As of last week I had 8 bananas in my freezer waiting to be used. One of my favorite recipes using bananas are these Banana Chocolate Chip Muffins. They work as a breakfast muffin or a sweet treat, and my little one loves them. 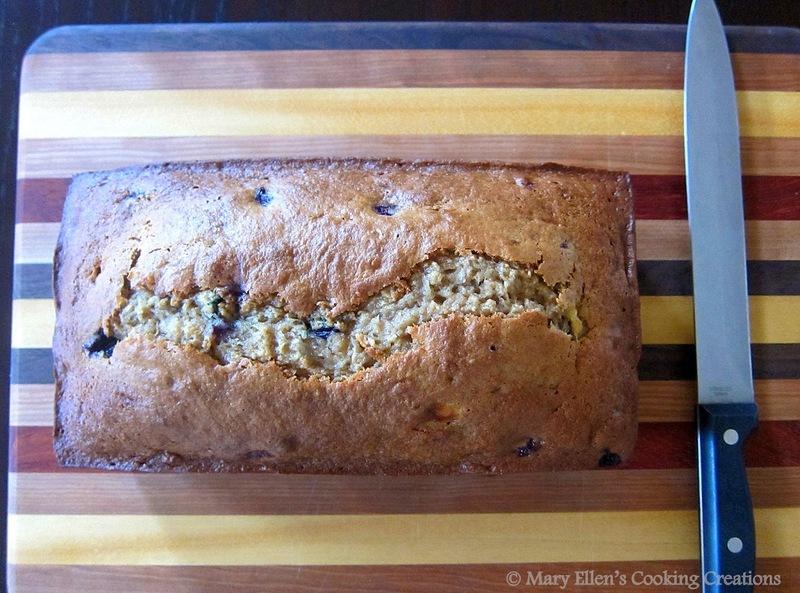 Last weekend I had some blueberries to use so turned to a recipe from the blog Cookaholic Wife and found a breakfast bread recipe that would use 3 of my bananas. To use the frozen bananas, take them out of the freezer about 15-20 minutes before they are needed. Then simple peel them and use them in your recipe. You don't even need to wrap them in plastic to freeze them - the peel is so thick that it protects the banana. It's no secret that I prefer cooking over baking. I despise measuring, so baking can annoy me to no end. But I have really tried to push myself and bake more often over the past few years. One thing I do to make it easier on myself is to measure out every single ingredient first. Sure, it makes more dishes, but it's easier on me, and it also makes it fun for my 3 year old daughter to help out. She loves picking up all of the bowls, pouring in the ingredients, and then mixing them. This bread was really easy, both sweet and tart from the flavors of the bananas and blueberries, and was so perfect with my cup of tea on a lazy Sunday morning. One more picture before I get to the recipe - doesn't it look like the bread is making a funny face at the camera? Preheat the oven to 375. Spray a (9 inch) loaf pan with non-stick cooking spray. In one bowl, mash the bananas with a potato masher or fork. Set aside. 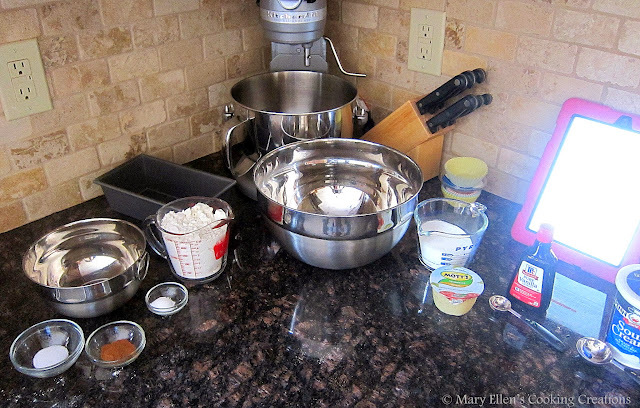 In another bowl, combine the flour, baking soda, cinnamon and salt. In a large bowl, whisk together the sugar and eggs until light and fluffy. Add the applesauce, yogurt, and vanilla extract. Stir to combine. Then add in the flour mixture, stirring until combined. Fold in the bananas and then the blueberries. Transfer to a wire rack and let cool for 30 minutes. Slice and serve. Thanks for the tip on freezing bananas! I always have extras but wasn't sure how to thaw them before using - but now I know! This bread looks amazing - I plan to try it soon. Yum! This looks so good. I love variations on banana bread! 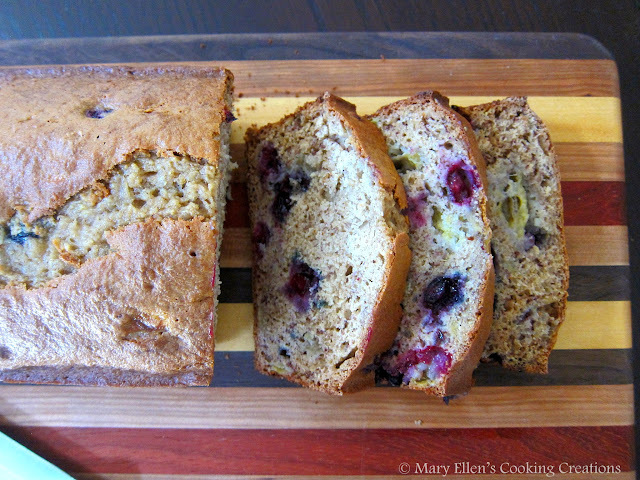 I saw a roasted strawberry banana bread recently... yum yum.